FOREST CITY, Iowa--(BUSINESS WIRE)--Winnebago Industries, Inc. (NYSE: WGO), a leading United States motor home manufacturer, will be featured in an upcoming episode of National Geographic Channel’s Ultimate Factories, premiering January 28 at 9 p.m. ET/PT. 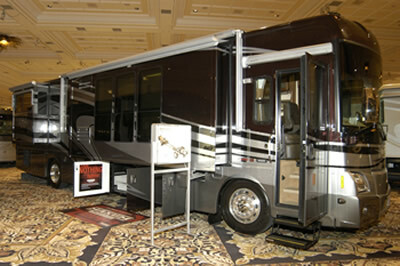 Ultimate Factories will feature the flagship of the Winnebago® brand, the 2008 Winnebago Vectra, being built from start to finish at its headquarters in Forest City, Iowa. The 40-foot Winnebago Vectra features a premium chassis design, plush interior and features that will amaze you, like a 37-inch LCD TV, Home Theater Sound System, Corian® countertops, UltraLeather® furniture, dishwasher, washer/dryer combination and central vacuum system. National Geographic Channel’s Ultimate Factories takes you behind the scenes and inside high-tech, mega manufacturing plants. The one-hour episode traces the history and evolution of Winnebago Industries, as well as captures the innovative engineering and design found in the Winnebago Vectra. Winnebago Industries operates what is clearly the largest and most sophisticated RV production facility in the world, with more than 2.5 million square feet situated on 570 acres in Forest City. With the use of automotive-styled assembly lines, Winnebago Industries produces the most motor homes in the industry, while maintaining stringent quality standards.